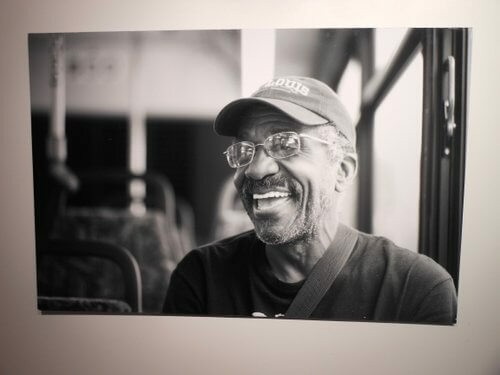 The traveling photo exhibit, Conversations on a Bus, is an original, charming, and gripping tribute to a city where beauty is found in many unexpected places such as in the conversations of everyday people. The show, currently on display at its last site, RNG Gallery in Council Bluffs, through March 3rd, consists of ordinary people discussing extraordinary things about their life and experiences all while riding on the bus. This show reveals a diversity of the Omaha population which is as rich as the stories they tell. It features 20 photographs and narratives of the people interviewed. During the month of July, husband and wife photography team, Heather and Jameson Hooton, rode on MAT buses interviewing and photographing the passengers. The significance of this project is the connections that are made between the people and the conversations that are shared. An example of this is of a WWII veteran and a 17 year old skateboarder. Each of these two share a similar interest – they both want to go to school for photography and they want to photograph people doing leisure activities. Heather came up with this idea while attending graduate school for music. “Anthropology has always been a hobby of mine, and so when I wanted to meet people and see what we had in common and hear their stories about their different background and cultures, I wanted to do it in an area where everyone was connected to something and that was the bus.” They decided to bring the idea to the Omaha Creative Institute to help with the collaboration. What makes this project so special is how the Omaha Creative Institute with funding from the Nebraska Humanities Council and the Nebraska Arts Council brought it to reality. Susan Thomas, executive director of the Omaha Creative Institute, felt this was an amazing project to present to Omaha. Sarah McKinstry-Brown is a poet and author working in Omaha. She was paired with the Hooton’s to transcribe the interviews they recorded. It was McKinstry-Brown job to weave these interviews into a story that breathed life into the photographs. “Because I am a poet I am always looking for moments or images or phrases that show we are all interconnected. The process of listening to these interviews and finding ways to see where stories connect and intersect is really a beautiful thing. I think it builds community and it can be very healing and I have a lot of respect for the project,” McKinstry-Brown said. The Hooton’s met many interesting people along their journey. “We debated if we should study the bus line, but we really held back and we did not ride on the bus until the project started,” Jameson said. But, they missed the bus the first day out. The first woman they interviewed shared how to navigate the bus system. There were other conversations that went a little deeper. Another woman they met on the bus said she was running errands, but she revealed a few minutes later that she was really looking for a job. There is quietness to the photographs, but the surprises within the stories make this show speak volumes. The stories of the people and their images show how art represents the way of seeing things and making connections of people you have never met, but can identify with. Conversations on a Bus continues through March 3rd, 2013 at RNG Gallery 157 West Broadway Council Bluffs, Iowa 51503. For more information call 712-256-4140.